Here is a giveaway in association with L'OREAL PARIS. 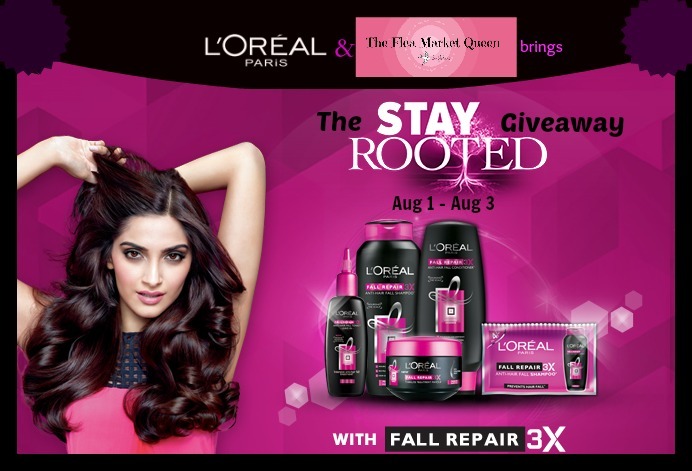 This Monsoon I am bringing you a little gift that will help you stay rooted!Enter this Giveaway now and get a mini-hamper from L'OREAL PARIS that rescues your hair. 1. Like L'Oreal Paris and TFMQ on Facebook. 2. Comment on this blogpost after watching the video-> What did you like the most about this video? 4. Giveaway ends on 3rd August. The video is the story of 3 people - a student in search of her teacher, a granddaughter who makes a small and simple sacrifice for her grandmother and 2 friends who reconnect at a place they call their own.The Jad Se Judein song takes you back to your roots and makes you remember that person who shaped you, those in your life who had a role in making you who you are today – but those who’ve unfortunately been forgotten today. CITY NAME :- CITY BEAUTIFUL "CHANDIGARH"
everythg abt the video s good.. frm the concept to the song,acting and of course Mohit's melodious singing... giving a good message to us,getting back to roots and if the roots r - stronger we will never lose the touch. FB Name- Radha ramachandran, CITY- Bangalore. I am a fan of both the pages on FB. let me confess my love for this so amazing, heart warming video. Mohit chauhan's magical voice and awesome lyrics of the song makes me relive the moments spent together here there and everywhere which bring back the smiles and tears altogether. The video makes me remember about the strong bond which we share with our near and dear ones, our sweet memories with them that are now almost forgotten, or that remain hidden in our sub-conscious mind. It makes me remember about the persons who have shaped me to a good human being. It makes me realize that some relations in life are stronger than anything else and they can not be forgotten easily. They remain strongly rooted to our memories just like the Loreal Paris that keeps our hairs rooted to our head. I like this fact that is put up so well in the video. This video gives us a sense of nostalgia and makes us realize that in this busy world we should take time out to appreciate people, things, places, moments from our past that have made us the individual we are today. Just love this video and thank you L'Oreal Paris for helping us stay rooted and connected with our dear ones. When u love and care for somebody,when u r connected by heart,u are ready to sacrifice anything for them.bond between people really matters a lot.i like the video because it put beautiful message of commitment and sincerity which keeps us rooted, no matter how younger or elder we are and how far we are from each other.when i watch this it reminds me of bond i share with my son.recollect most cherished moments of my life with him .this keeps me rooted to up n downs,happiness and sadnees of my life. i also liked voice quality of singer mohit and picturization. Actions speak more than words.. that was truly reflected in the grandma and her grand child actions.. a child is always a child however grown up they might be. I never got to spend my childhood with my grandparents so always wondered how it would be. Nevertheless, I always get tears in my eyes when I come across such incidents. Nothing would have been more better than Mohit's pleasant voice for that song. I am already in tears as I write this. I have my grandparents in front of my eyes. I hope they souls are in peace. Just like the video suggested, it's all about staying rooted. In this busy world, where we have no time for others, taking out a little time to spend with those who matter the most gives a sense of joy. It's all about staying connected with them. Sharing a cup of coffee over a conversation, meeting old friends and reliving old days and of course doing good for others. It's the simple things that give us immense joy. In fact the video fills you with nostalgia and reminds you how important is to show your love, care and concern. It is necessary that we respect and value others and spread joy. I loved all the 3 stories they have depicted in the song especially the one in which the two frnds meet after so long and then play the same game and have the same fun they used to have as kids....This video made me feel very nostalgic and remember all the special people that have been a part of my life and whom i havnt met up with for a very long time..I guess this is wht i like the most about this video..after watching those three beautiful and heart touching stories i too have realized the importance of staying connected with the people who are important or have left an impact in our lives.. The video shakes me up n takes me down to memory lane..all the small little things which I dont value now ..life was so good. .small little things gave me joy.I loved all the stories especially grandmother n grandaughter.it reminds me of my grandmother who is my role model.she was smart, beautiful n educated.she inculcated values of life n joy of living. To be compassinate , empathetic , I learnt from her.I wish I could go back in childhood n enjoy the things like playing with her.school , silly games, kind teachers.the video emplores me to time travel back to my roots n growing up years. To Nourish, Inspire and Prosper from. Seem to be part of a story. Roots is the true home of yours. To distinguish between friends and foes. Every moment is just a moment-here now and then its fleeting. That we ask the questions,How,When,Where. For a weary soldier, as is a break from strife. Do not worry as the end is around the bend. And Roots is where we go!